We want to be an outpost of hope and encouragement to this “Invisible Generation” and with your partnership we will expand our vision to reach more Young Adults! A Safe place where the can come as they are not having to change who they are to fit into the structured church environment." The Unchurched, secularized young people will need young adult ministries that focus on the basics of the Christian faith and the fundamentals of leadership. Young men and women will be seekers. And the gospel message will be foreign and intriguing. So small group Bible studies, life-support groups, issue research or skills training seminars, outreach activities and public advocacy will give them the chance to care for one another, mature in their faith and prepare for leadership. The next decade’s high-tech, low-touch society will breed restlessness, emptiness, meaninglessness and hopelessness in young adults. They’ll be searching for experiences that transcend the surface and touch them at their core. They’ll find those experiences in places of peace and solitude. In the last quarter of the 20th century, we’ve witnessed the privatization of the Christian faith. Beliefs and values have become individual matters; religion and ministry are confined to our "personal lives." The public arena has been left to TV executives, politicians, educators, scientists and economists - all purveyors of their own ideologies. This has left our society without positive moral direction and Christianity without significant witness and impact in the public arena. If Christianity is to make a difference among young adults, it must publicly and creatively evangelize the next generations. We together can make an impact in our next generation. Please donate to the Young Adult Crisis Hotline and Biblical Counseling Center today and effect the life of an unreached Young Adult. Join in a valuable partnership in reaching our next Generation today and help impact this next generation with Eternal Life with the Good News. We are Affiliated with TOPEC (Total Personal Care Foundation) an Internationally recognized nonprofit that is registered as a 501(c)3 with the Internal Revenue service and can receive donations that are Tax-deductible. A tax-deductible receipt will be given. Any donation is appreciated and will touch a valuable life! 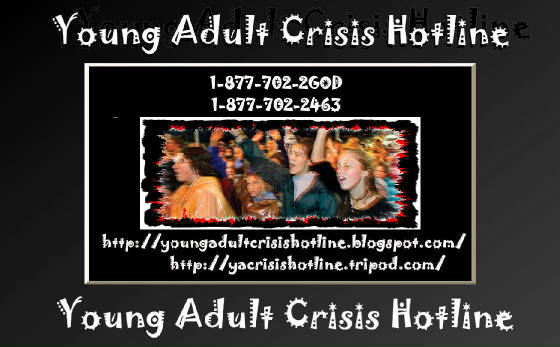 The Young Adult Crisis Hotline and Biblical Counseling Center are Affiliate with TOPEC (Total Personal Care Missions International, Inc.) an Internationally recognized nonprofit that is registered in New Jersey as a 501(c)3 with the Internal Revenue service with corporation number 0100490873 and can receive donations that are Tax-deductible to the Giver Please consult your accountant or a professional for further information on giving. Please press the Donate Button for online secure donations with PayPal! Making the most of your contributions includes not only finding a charity that's right for you but also knowing about your tax benefits. TOPEC Foundation– are registered with the IRS as 501(c)(3) organizations and have been given tax-exempt status. To learn more about this and other related topics, please browse our FAQs below. For charities, this means that they can accept contributions and offer donors a tax deduction for their gifts. For donors like you, this means your contributions are fully tax-deductible to the amount allowed by law. The email receipt you receive from TOPEC Foundation does indeed meet all the IRS requirements as a record of donation. The chart below gives the deduction for a single person in each tax bracket making a cash donation of $100. The instructions for the 1040 Form will help determine the exact amount of your deduction, which will vary depending on your tax bracket and whether you file as a single person or jointly. What counts as a charitable organization? A charitable organization is generally defined as any nonprofit organization that is incorporated and identified by the IRS as a 501(c)(3) organization. Our organization has been given tax-exempt status and can accept contributions. NOTE: Not all donations to nonprofits can be claimed as charitable deductions, even if the organization is registered as a nonprofit. Check with the IRS on whether or not an organization can receive charitable deductions. How can I take a deduction for my donation? To claim a deduction, you will need to fill out a 1040 Form, which is available through the IRS website, and itemize your deductions on Schedule A. If you fill out the short form or take standard deductions, you cannot claim your contributions. Do I need a receipt for donations I make? The IRS doesn't require receipts for cash donations under $250, but you should keep donation information on file. Cash contributions of $250 and over require an acknowledgement that must be sent to the IRS with your tax returns. Every time you make a donation through TOPEC Foundation, that donation is recorded in your Giving History by the year, a feature that makes itemizing your taxes simple and convenient. Do I need any acknowledgement for donations under $250? Though the IRS doesn’t require receipts for donations under $250, it is a good idea to keep this information on file. Be sure to keep the canceled check, credit card statement, or email receipt from the organization to which you donate. Always note the donation amount, the date of the contribution, and the name of the charity. For donations over $250, what information does the receipt need? The receipt needs to record the donation amount, the date the donation was made, and the name of the charity, as well as a written acknowledgement from the organization of any property or services that you may have received in return for your donation and an estimate of their value. The IRS should acknowledge an email receipt as an acceptable record of donation, but to be certain, always consult your tax advisor. When you donate on TOPEC Foundation, your email acknowledgement will provide the amount, transaction date, and the charity name, all things the IRS wants you to keep a record of when you donate. You will also have to submit your receipts to the IRS by the due date for tax returns OR by the date you file your tax returns for the year in which you made the donation, depending on which one comes first. Can I receive a tax deduction for a donation to an overseas nonprofit organization? If you want to take a deduction for your donation, be sure to donate to a charity registered in the United States. Even though TOPEC Foundation is Internationally Recognized in other Countries it is registered in the United States as a 501(c)(3) organization. Can I take a deduction for volunteering my time and services? You cannot deduct the value of time or services to a charitable organization, but you can deduct any hard costs associated with that volunteering, such as the gas or bus fare it costs to get there. For example, if you volunteer in a charitable hospital and have to wear a uniform, you can deduct the cost of buying and cleaning the uniform. Your friends at the IRS will let you deduct any out-of-pocket expenses you acquire in the course of volunteering. If you have specific questions, please contact your tax advisor or the IRS publications on charitable giving. Disclaimer: TOPEC Foundation does not warrant or guarantee the accuracy, quality, completeness, or validity of any information it provides. All information has been obtained from sources believed by TOPEC Foundation to be accurate and reliable. Please consult your tax advisor for specific tax advice.